Description: It is an annual herb with a stout, hairy stem. 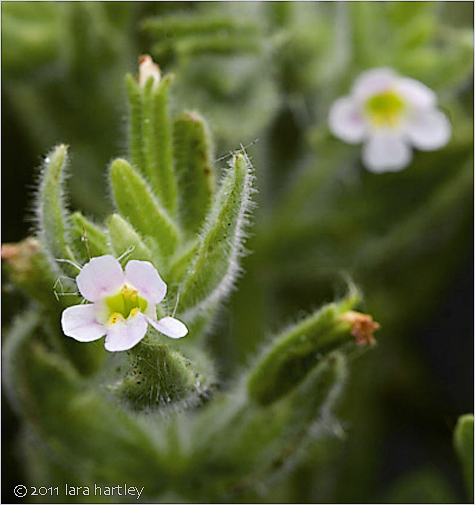 The narrow, tubular base of the flower is encapsulated in a ribbed calyx of sepals with pointed lobes. The five-lobed flower is white, often tinged with pink. Leaf: The oppositely arranged oval or widely lance-shaped leaves are up to 7.5 cm long. 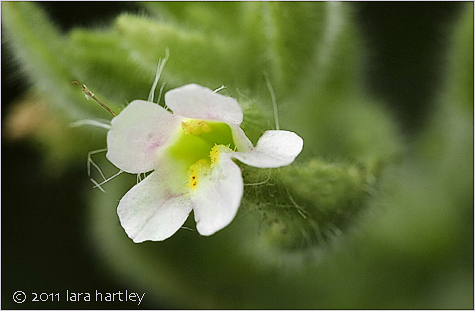 Notes: Mimulus parishii is a dicot that is native to California and is found only slightly beyond California borders. This photo was taken on July 2, 2006 in Whitewater Canyon, Riverside County, California.